Since there are THREE registries (that I am aware of at this time) for the dogs that declare themselves to be 'SHILOH'S'... I am sure there are three different Standards some where in cyber land but you may have to do some digging. My Comments: There are so many web sites and information out on the web about the Shiloh that my brain hurts just trying to keep up with all of it. The original Shiloh's come from Tina Barber and her Shiloh Kennels. Though Tina may have gotten a 'shiloh shepherd' from a gal who had a couple or a few but who did not register or trade mark that name. Tina used the name and registered her dogs under this name within the American Kennel Clubs Registry (AKC). There is nothing illegal about taking a good idea or a name that someone else has used but has not 'bought' the rights to (or Trade Marked), and using it unless the person using that original name asks you not to and/or is willing to fight for it or take the matter to court. If this is in fact true, that Tina liked the name so well that she registered it through AKC and the original owners of the 'Shiloh Kennels' did not ask Tina NOT to use that name, then it was legal for her to use it, though it may not have been ethical. I was around during the time that TIna was breeding and showing her 'shepherds from the 'Shiloh Kennels' and am a witness to the adds within the magazines that she addvertised with. Back then if I wanted a Shiloh Shepherd, I would have gone to the Shiloh Kennels and gotten me an AKC German Shepherd Dog registered as a German Shepherd Dog from the Shiloh Kennels. Tina does have a ton of information within her web site(s) (too much in my opinion) but maybe it is necessary for her to do things that way seeings how all the 'splinter' groups have tried to take her breed and run with it. This happens with so many rare or new breeds and It is a shame. Who knows the Shiloh better than the breed founder? And in my opinion no one should be able to take what some one else has made and named. If others like the breed or the looks of this dog then maybe they should change the name and create a breed for themselves. Not such a simple task! Google Shiloh Shepherds and I am sure that will head you in the right direction. Just try not to get lost. I know an awful lot of doggy people and I mostly Identify with the HOME OWNER who owns a dog or two as it is there where my heart is. 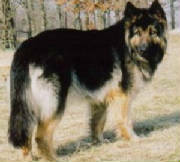 Since I know so many large breed, GSD, Shiloh or King Shepherd owners, many of them have sent me photos as well as comments about thier dogs. ALL OF THEM LOVE THEIR DOGS! But many have serious health issues with their beloved pets. If you are an owner of what you THINK is a SHILOH, you may wish to contact Tina's group and discuss matters with them. A lot of folks may not want to talk with the Founder herself as she has a pretty strong conviction and anger over what has happened to her. Emailing her may work out for you though as I do get a feeling that she is truely very concerned with any of her dogs that have ailments or problems and she has a web site where she files and names everything a dog comes down with. This is of GREAT IMPORTANCE when breeding dogs. (Note: As of July 2011 Tina has passed on). Some of you want to know what a shiloh looks like so here are some photos of Shiloh's that were sent to me. I place them here not to debate whether they are the 'real' Shiloh's or not as I DO NOT KNOW what kind of papers they hold. All I know is that they are registered and hold papers declaring the dogs to be Shiloh's. I have seen many Shiloh's over the past 25-30 yrs, but were they the true Shiloh's? Most of the American public (homeowner, first time dog buyer) do not know what the difference is. Nor do they realize what is going on in this world of Pedigrees and Registrations, they just want a nice dog and they work hard for the money that they send to breeders who send them their 'once in a lifetime' dog. If one of these dogs is yours and you wish for me to tell the world, yes, write me and let me know the info. If one of these dogs is yours and you do NOT want the dogs photo on this site, write me and I will gladly remove it. 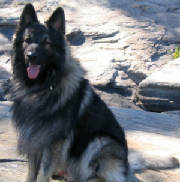 Many say that the American Alsatian, the King Shepherds and the Long Coated Shepherds also resemble the Shiloh and visa versa. Don't feel like you are the only one that can not tell the difference as 99 out of 100 everyday folks think all of them are SHEPHERDS. My last comment on this BREED (and its founder) is that I can not go without mentioning that Tina Barber contacted my sister and wanted to bred to one of my sisters dogs. My sister at that time was showing/breeding AKC German Shepherd Dogs in San Luis Obispo California. Like many real breeders my sister Dusty had spent many years breeding a select few GSD and trying to improve on her stock. She was not rich by any means yet her stock was winning in the rings. Tina saw one of her large males and contacted my sister about him. My sister thought Tina was a Christian and agreed to fly 'Duster's Boogie Down' to Tina's kennels in exchange for Tina showing and handling him to get the last few points that he needed to become a champion. Tina was supposedly very busy and never got around to showing/handling Duster but found the time to breed him, so she said. My sister got a phone call from several people who worked for Tina and they told my sister that her dog had died when Tina tried to break up a fight between Boogie and another Stud male dog of her kennels. My sister had told her that Boogie was from a farm and was used as a herd protection dog and that he was NOT allowed to be near any male dogs. It may have been that it was an accident that Boogie and a Male dog came to be in this fight and the only way that Tina could get the two apart was to kick Boogie in the kidneys. The next day Boogie died. Dusty confronted Tina and Tina confessed that the dog had indeed died. Tina did not offer to pay my sister for the dog or reimburse her in any way. Since Tina had lied, covered up and deceived my sister there was no more to do but to mark it up as an experience and go about her life as it would cost too much to bring Tina to court. AKC contacted my sister and demanded that she sign paperwork declaring that 'Duster's Boogie Down' was the sire to many litters. My sister would not and did not sign any such paperwork and was threatened by AKC. My sister then told AKC that they did not have to threaten her as she was not going to participate in any dealings from a registration club that conducted business in the way that they did. All of us breeders knew that at any time an unscrupulous person wanted to, they could find pound pups that appeared to be the same age and breed as the dogs they bred and attach EXTRA paperwork on them and sell them as AKC registered stock. Many breeders forged paperwork or put a single pup into a litter with a different dam and sire just to avoid the paperwork and fees. AKC registration did not mean the dogs were guaranteed to be pure of breed, so who cared if the dogs were AKC registered? The information that my sister got from informants at the Shiloh GSD kennels was that Boogie died before he sired any pups. Her Shiloh's pedigrees show 'Duster's Boogie Down' as one of the foundation stock. Now perhaps Tina has been born again for the second or third time? But the fact still remains that she has never reimbursed my sister. She has recently contacted her, but I did not delve into the conversation as I tend to not wish to intrude. One day I am sure my sister will tell me what was said. What I would like to see happen, is that Tina Reimburse my sister for all that she did to her. Perhaps that is why so much has befallen upon the "Mashiloh"?